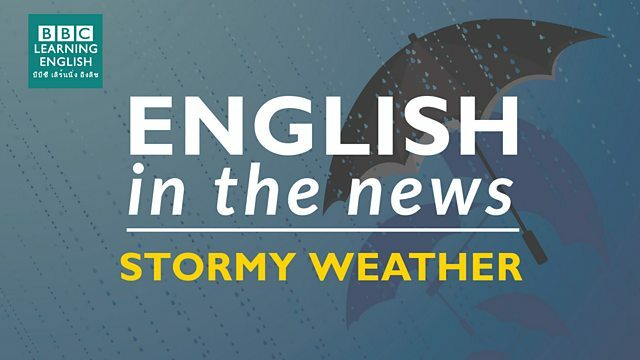 How to talk about wind and rain! วิธีพูดถึงลมแรงและฝนตกหนัก! Storm Ophelia has brought hurricane-force winds and heavy rain to Western parts of the British Isles. Gusts of over 100 miles an hour were recorded off the South West coast of Ireland as one of the most powerful storms in decades moved in from the Atlantic. The storm will weaken as it moves across South-West Scotland, West Wales and North-West England tonight, but strong gusts are still expected. Can you remember what Sian said about 'strong' and 'heavy'? Which phrase means 'a sudden strong wind'? A strong ______ of wind blew my hat off my head. Pay attention to the article 'a'. There was a heavy ______ on my way to work this morning.